Sugarcane is known to be one of the oldest cultivated plants in tropical and subtropical countries. Sugar industries are increasing exponentially to satisfy the growing demand for sugar; whereas, the ethanol distilleries have been rapidly expanding, since bioethanol emerged as an affordable, low carbon footprint and renewable bioenergy. However, inadequately treated and indiscriminate disposal of the effluent from sugarcane industries resulted in extensive soil and water pollutions. Hence, this study aimed at reviewing the sugarcane industrial process with its water consumption rates, and effluent characteristics and its adverse effects on the environment. Finally, the study has gone through the most common wastewater treatment efforts made to minimize the effluent environmental burden. In addition to the large volumes of sugar and ethanol industrial effluents, the presence of the different varieties of the pollutants in the effluent is challenging for conventional treatment methods. However, eliminating the pollutants is becoming important for environmental and esthetic values. In line with this, a number of studies encompassing physicochemical and biological treatment methods have been conducted but many of them failed to be effective. Furthermore, alternative treatments have also been developed such as recycling of vinasse, fertirrigation and concentrated by evaporation but they were not effective either due to the high energy use or the large effluent volumes which cannot be managed through such methods. However, anaerobic digestion of high rate was found in the state of the art and an effective approach to treat the sugar industry and ethanol distillery effluents. Among many agro-based industries, the sugar industry is the most common industry in more than 130 countries, especially in developing countries. This industry is currently making a substantial contribution to economic development and the major sources for the job creation in many developing countries in Asia, Africa and South America. The industry is involved in sugarcane processing action to produce raw sugar from more than 70% of the sugarcane produced in the worldwide . In addition to sugar, the industry produces byproducts such as bagasse (residue from sugarcane crushing), press mud (dirt mud residue from juice clarification), molasses (final residue from sugar crystallization) and wastewater . Furthermore, production of bioethanol as an industrial product is also widespread among sugar industries annexed to ethanol distilleries. Ethanol has existed since the beginning of recorded history. The ancient Egyptians and Chinese produced ethanol by naturally fermenting vegetative materials and discovered the art of distillation. Fermentation is the oldest known biotechnology and complex biological process used for the production of ethanol in the distillery. Recently, bioplastic production has emerged as one of the primary interests in the sugar processing industry in which the sugar is converted into lactic acid and polymerizes into biopolymer . Recently, biorefinery is emerging as the integration of the different sugarcane industries based on biomass feedstock. Recently, the expansion and promotion of bioethanol production are absolutely creating high competition for water resources in many places across the globe . In biorefinery, biomass is expected to go under physicochemical and biological processes to produce biofuels, power, materials, and chemicals. Nowadays, biorefinery is enhancing the environmental and economic benefits of the sugar cane industry. The sugar industry and ethanol distillery are growing at an alarming rate across the globe but the industries are generating a huge volume of the effluent that disposed into the environment. These inadequately treated and indiscriminately disposed effluents are causing extensive soil and water pollutions. Hence, the aim of this study was to assess the literature regarding the sugarcane industrial process and its water consumption rates, effluent characteristics and the adverse effects on the environment. The study also evaluates the most common wastewater treatment efforts made to minimize the effluent environmental burden. Sugar industries can be classified broadly into three categories: (1) those that produce only raw table sugar (2) those that produce only ethanol, and (3) the integrated ones that produce both raw sugar and ethanol. Many sugar industries belong to the sugar factory annexed to ethanol distilleries. For example, 80% of the factories approximately belong to the third category, especially in Brazil and many other countries around the world are following this trend . However, a recent report indicated that 90% of sugarcane harvested is used to produce both sugar and ethanol, but only 7% and 3% are used to produce ethanol and sugar, respectively . In general terms, the sugar production process comprises juice extraction, clarification, evaporation, crystallization and centrifugal processes in the cane factory as shown Fig. 1. Based on the chemical utilization types, there are two categories of sugar manufacturing processes which are carbonation and sulphidation processes. The agricultural sector and industries are the major areas of the freshwater consumption rate which, indicated by the universal features of sugar production that, need huge amounts of freshwater. 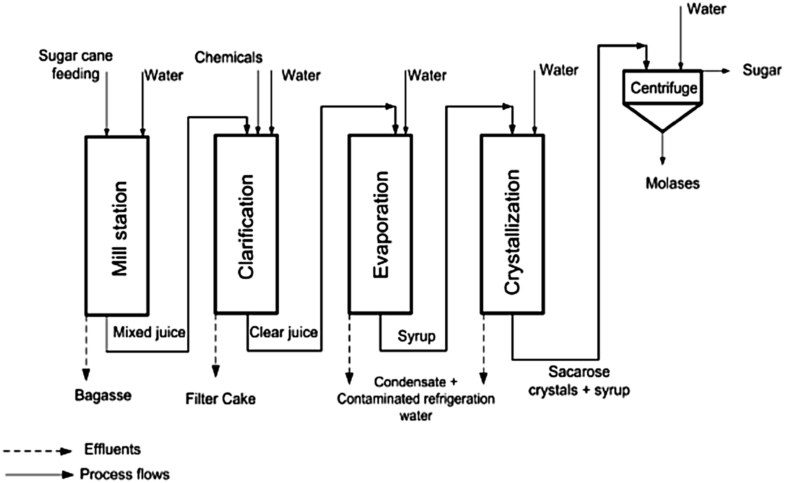 The freshwater is used in different units of the sugar production processes in the sugar factory and generates wastewater which is highly variable in both quantity and quality, as indicated in Fig. 2. 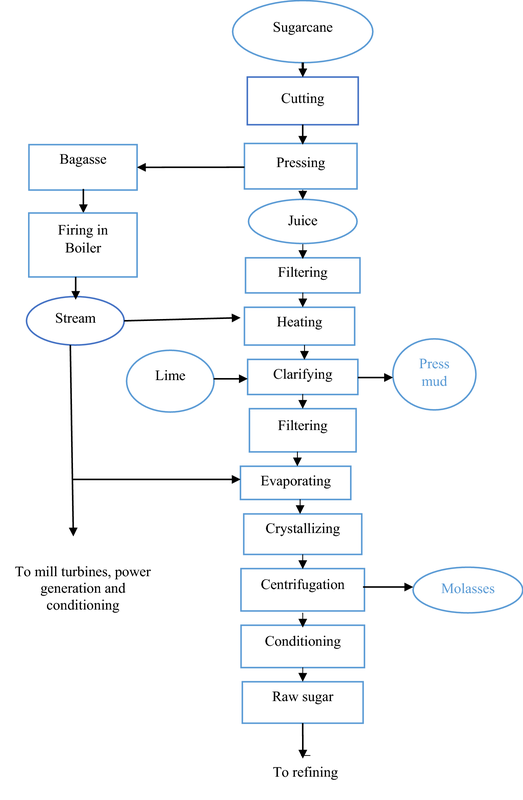 This figure shows the details of each process in the industry and the corresponding of the wastewater generated. This variation of wastewater depends on the feedstocks, products and chemicals used in the process. In the sugar industry, water is obtained from two sources. Primarily, during cane processing water is recovered during processes such as evaporation, crystallization and refinery whereas the other water sources is mainly from barometric condensers, dust removal in the chimney and scrubbers and refrigeration of turbines including washing water . Moreover, sugarcane that enters the industry contains about 70–80% moisture and about 0.7 m3 of the wastewater is generated per ton of crushed sugarcane [8, 9]. Many studies of the sugar industry in different countries reported that about 1 m3 of wastewater is produced for every ton of cane crushed. It was also reported that around 1.5–2 m3 of water is consumed to process 1 ton of cane and generated about 1 m3 of wastewater . In the sugar industry, water is used for cleaning purposes in the different sections of the factory generates wastewater. Practically, there are no single units which generate wastewater but the wastewater is produced mainly by washing on the milling house floor, boiling house like evaporators, clarifiers, vacuum pans, centrifugation, etc. Additionally, periodical cleaning of lime water and SO2 producing house is also contributing to the huge volume of wastewater, as well as periodic descaling of heat exchangers and evaporators using NaOH, Na2CO3 and HCl for descaling of heater and neutralization . Precisely, mill house and process house are the two main sections of wastewater generated in sugar factory. The mill house wastewater is polluted mainly with oil and grease, and suspended solids; whereas, the wastewater generated from process house is contaminated with high organic matter such as COD, BOD5 and pH . Studies of physicochemical properties of the sugar industrial effluent which were collected and analyzed from the mill house, process house and final combined wastewater indicated that the effluent qualities and quantities are quite different . Sugar industry effluent quality varies depending on chemical types utilized, the nature of the sugarcane such as the cane variety and the nature (physicochemical and biological) of soil in which the cane is grown. Generally, this effluent creates serious environmental problems, if it is not properly managed. One of the most critical environmental problems of developing countries is the improper management of industrial wastewater due to the complex nature of the wastes generated with the limited technologies to remove all pollutants at a time. Sugar industries play a major role in polluting the water bodies and land by discharging a large amount of wastewater as effluent which has a high amount of solids, BOD5, COD, chloride, sulfate, nitrate, calcium and magnesium [12, 13]. Wastewater from the sugar mills with high BOD5 and COD can deplete rapidly the availability of oxygen content in the water bodies and endanger the aquatic life by interfering with the survival of the aquatic flora and fauna. Additionally, due to improper wastewater management, the septic conditions created which will generate foul-smelling hydrogen sulfide resulted in precipitation of iron and dissolved salts that make the water bodies black . Furthermore, polluted water bodies with this industrial wastewater are unfit for both aquatic life and human uses [13, 15]. Hence, without proper treatment and dilution, direct utilization of sugar industry wastewater for crop irrigation significantly inhibits seed germination and seedling growth . Ethanol distillery is the highest consumer of raw water (25–175 L/L of alcohol) for non-process applications, like cooling water, steam generation, etc. and the process consumption such as yeast propagation, molasses preparation . The major sources of wastewater in molasses-based distilleries are: fermenter sludge, spent wash and spent lees as indicated in Fig. 3. Fermented wash is the main product of fermentation which is decanted; the remaining sludge is known as yeast sludge (fermenter sludge). This discharged effluent from the bottom of the fermenters contributes to the pollution load from the distilleries. Hence, the fermenter sludge is the wastewater generated after fermentation, which is separated from the ethanol solution by filtration. However, spent lees are the residue obtained from rectifier column which are usually recycled. Normally, spent lees are hot and colorless liquid at the generation rate of 1.7–2.0 L/L of rectified spirit [18, 19]. Among these wastewater categories, spent wash is the major wastewater of the ethanol distillery, both in terms of quality and quantity, and is referred to as vinasse, stillage, slop or molasses spent wash . Practically in the distillery, the spent wash production rates and characteristics are highly variable depending on the type of feedstocks (quality of molasses), fermentation technique, and unit operation in molasses processing and ethanol recovery process . These factors are the major contributors to the pollution load of the distillery effluent. Generally, spent wash is the main source of wastewater in distillation process which is subjected to treatment. Distillery spent wash is the most complex and troublesome effluent having strongest organic matter in terms of high COD (80,000–160,000 mg/L), high temperature, high ash content, low acidity (pH 3.7–4.5) with a high content of dissolved inorganic salts [21–23] Hence, this molasses spent wash is one of the most difficult waste products to dispose because the pollutants are environmentally not compatible . In addition to high organic matter contents, another peculiar feature of the spent wash is its deep dark brown color which resulted from the color causing pigments. Furthermore, the colorant of spent wash is mainly caused by melanoidins (from Maillard reaction of sugars (carbohydrates) with the protein amino groups), caramels (from overheated sugars—caramelized), phenolics (from tannic and humic acids of the feedstock), and furfurals (from acid hydrolysis) . Specifically, the caramelization is the chemical reaction process of sugars at high temperatures, which can be catalyzed by the acid and base solution . Generally, this color-bearing distillery wastewater is a challenge to treat. Among the color causing pigments, melanoidins (C17–18H26–27O10N) are the major cause for the dark brown color of the spent wash which is formed under non-enzymatic (Maillard) reaction between sugar and amino compounds at high temperature [26, 27]. Melanoidin is described by its unique nature such as the recalcitrant, antioxidant, acidic, nitrogen containing dark brown polymeric compound . Normally, molasses-based ethanol distillery spent wash is the major source of melanoidins wastewater source . The estimated molecular weight of melanoidins is to be between about 5000 and 40,000 Da and accounts for 2% of the total spent wash by mass [30, 31]. Additional properties of the melanoidins are very negatively charged long polymer of acidic compound with colloidal properties due to the dissociation of carboxylic acids and phenolic groups . The molasses distillery wastewater has similarities with sugar industry wastewater in composition, but the distillery spent wash is a high strength wastewater. Comparative analysis of the physicochemical quality of the sugar industry and distillery effluents was conducted under similar condition which showed clearly the difference in concentrations strength as indicated in Table 1. The consequences of untreated industrial effluent discharges have been known for a long time. Specially, the discharge of untreated melanoidins containing spent wash into the water bodies can block sunlight from the water, which results in reducing photosynthetic activity and oxygen concentration that inhibit the survival of aquatic life . Additionally, untreated spent wash can reduce dissolved oxygen concentration in water bodies and soil alkalinity reduction, which cause the inhibition of the seed germination in the contaminated area . The disposal of untreated distillery spent wash also causes high turbidity in the water bodies, which reduces light penetration and impairs the biological activity of aquatic life . Furthermore, the acidity of the spent wash causes the dissolution of metals in the water bodies which create infertile environmental conditions for aquatic life. Inadequately treated spent wash is rich in nutrients such as phosphates, nitrates and sulfates. Hence, the direct discharging of such spent wash into the water bodies could result in eutrophication of contaminated water sources . Sometimes, the leaching of distillery spent wash into the ground water table resulted in severe ground water contaminations . The organic load of untreated spent wash causes the proliferation of microorganisms which resulted in depletion of the oxygen dissolved in the water bodies and killing of aquatic animals and plants . Furthermore, the discharge of spent wash into water bodies releases an unpleasant odor due to the presence of pollutants and also contributes to disseminate endemic diseases in the absence of natural predators. Direct damping of such distillery spent wash posed a risk of soil salinization and contamination by zinc and manganese . Those animals in the contaminated area of the industries which directly consumed water contaminated with the spent wash, resulting in poor health conditions and increasing livestock mortality . Therefore, distillery effluent is posing a threat to the different components of the environment and living organisms. Generally, the discharge of untreated distillery spent wash is an eco-toxic effluent and unsafe to use in any forms for human and environment in any forms such as agricultural and aquatic ecosystems . One of the ultimate goals of wastewater management is to eliminate any current and future potential threats of the pollutants to living organisms and environmental health. Hence, wastewater treatment is very critical to overcome such pollution burden on the environment. Basically, the wastewater treatment methods are primarily consists of physical, chemical and biological methods which targeted the removal of the pollutants aiming to reuse the water resources for different applications. To achieve different levels of contaminant removals, the classical approaches of the wastewater treatments are combined into a variety of systems, such as preliminary, primary, secondary, and tertiary wastewater treatment. In these conventional wastewater treatment systems, primary treatment is to remove solids, oils and fats; secondary biological treatment to remove organic matters and nutrients and tertiary treatment is usually the polishing stage . The most common practices of wastewater management for the sugar industry and ethanol distillery wastewater in Brazil and India (the major sugar producers in the world) are fertirrigation, biocompost and concentration by evaporation (incineration). Fertirrigation, the use of soil as a medium for treatment and disposal of industrial wastewater, is becoming a common practice . Application of wastewater in agricultural fields may be a viable method of disposal, and would sustain agriculture in non-irrigated areas where the availability of freshwater is very limited . This practice can reduce fertilizer consumption and irrigation water cost as it is available without paying any cost and rich in various plant nutrients. However, the disposal of distillery spent wash on land is equally hazardous to the vegetation . Furthermore, raw distillery effluents have highly toxic effects on the growth and germination of seeds, even at low concentrations . Therefore, the use of spent wash for fertilization and irrigation has a severe impact on soil quality. This direct application into the soil as manure might deteriorate the physical properties such as permeability, aeration, soil structure and composition. This deterioration might be getting worse as the time moves on. The concentration of distillery spent wash by evaporation is another alternative for the use of this residue. This wastewater can be burned in special boilers generating energy and the condensate removed by evaporation can be treated and reused by the factory, decreasing water use in the facility. The product obtained in this process can be used for livestock feed preparation . This treatment technology can reduce the costs of transportation in tanker trucks, increasing radius of spent wash application where fertirrigation is unfeasible. However, this process has problems associated with the fast incrustation of evaporators, energy intensive process, and spontaneous crystallization as the concentration of solids increases [42, 46]. High energy demand is probably the main constraint of this treatment technology. Biocomposting is another wastewater management practice in the sugar industry sector. However, composting takes place by the anaerobic decomposition process, whereas biocomposting is the preparation of an organic manure which can be made by mixing the press mud (mud and dirt residue from juice clarification) with distillery spent wash [47, 48]. Conversion of industrial waste into organic rich manure is not only solving the problems of waste disposal and pollution, but also replenishes the soils and reduces fertilizer cost. However, raw distillery spent wash has to be subjected primarily to anaerobic digestion (bio-methanation) treatment to decrease BOD5 and COD and other pollutants before combining with the press mud to produce biocompost [49, 50]. Furthermore, it is difficult to manage the huge volume of distillery spent wash through biocomposting process, which is a very slow process that can take about 15 days for a single treatment, in addition to the large treatment space requirement. The effect all these common treatment technologies on the environment is increasingly understood and researchers have focused on finding efficient and adequate treatment technologies for sugarcane industry wastewater. Various conventional physicochemical methods such as coagulation–flocculation, sedimentation, filtration and different combinations of these methods have also been tested for the treatment of sugar industry wastewater and distillery spent wash, but were not effective . Moreover, the implementation of these methods has some eventual drawbacks in terms of hazardous by-products formation, the large amount of sludge generated, excessive chemical and energy requirements . There has been a growing interest in developing biological treatment systems which are the common procedure for wastewater treatment to eliminate solids, nutrients and organic matter [52, 53]. Normally, biological wastewater treatment processes use microorganisms to utilize wastewater pollutants for growth and convert the organic substrate in the wastewater into simpler substances such as CO2 and water . Hence, biological wastewater treatment processes are employed for the removal of pollutants from various industrial wastewaters to safeguard the health of living organisms and for environmental sustainability . Principally, the biological treatment method is effective for highly polluted agro-industrial wastewaters from the sugar industries and ethanol distilleries . The application of biodegradation of the industrial wastewater treatments could be a viable and low-cost alternative to conventional physical and chemical processes. In line with this, the most common and practical conventional biological treatment methods such as trickling filter, lagoons and activated sludge are commonly used in industrial wastewater treatment but are inefficient in the removal of the color causing pigments. Furthermore, the color causing pigments of the distillery spent wash are not effectively degraded by conventional biological treatment methods because only about 6–7% of the pollutants can be removed . Additionally, the removal of pollutants and toxic materials from industrial wastewater is increasingly shifting from the use of conventional approaches to the implementation of the advanced bioremediation processes of high-rate anaerobic condition . Classic anaerobic wastewater treatment systems are related with the earlier digesters such as septic tank and Imhoff tank that are known as decanter–digesters, in which settleable solids were retained and digested at the bottom by the anaerobic sludge. However, the current anaerobic treatment technologies, the high-rate anaerobic reactors are the most suitable and attractive primary treatment option for high-strength organic effluents such as sugar industry wastewater and distillery spent wash . High-rate anaerobic is anaerobic reactor that can be used for high-strength wastewater treatment having the properties of high loading capacity, eliminated the need for solids separation and recycling, better stability withstand toxic shock loads, resistance to inhibitors, low sludge production with high treatment efficiency [23, 44, 57]. Basically, the high-strength wastewater refers to the elevated concentration of the pollutants in the wastewater, for example, BOD, 60,000 mg/L; whereas, the higher loading rate refers to the concentration of the given pollutants with respect to time, for example, 8 kg BOD/m3/day, especially in the process of the wastewater treatment plant [22, 44, 58]. Additionally, high-rate anaerobic reactors are required much less volume and space due to the advantage of high-load system’s capacity . The most commonly used high-rate anaerobic digesters in wastewater treatment areas are: up-flow anaerobic sludge blanket (UASB) reactors, fluidized beds, sequencing batch reactors and anaerobic filters. The increasing utilization of anaerobic treatment systems is highly associated with the development of high-rate anaerobic reactors that able the separation of HRT and solid retention time (SRT) . Besides this, the attached growth (biofilm) anaerobic remediation has additional advantages over suspended growth bio-reactors, including more stability in operation, higher tolerance for pH, temperature, and toxic shocks, higher utilization rate of substrate, and the ability to retain high biomass concentration under shorter HRT [44, 59, 61]. Even though these techniques have many advantages over conventional methods, digester operation at lower HRT, higher OLR, biomass washout, clogging, short-circuiting, process inhibitions, poor final effluent and biogas quality are the main challenges associated with these techniques . Furthermore, it was reported that the general range of the anaerobic high-rate reactor biodegradation of high-strength industrial wastewater such as the distillery spent wash is not sufficient to be discharged into the environment as indicated in Table 2. UASB technology is being used extensively for different effluent treatment such as sugar industry, distilleries, food processing units, tanneries and municipal wastewater. UASB reactor is based on that anaerobic sludge exhibits inherently good settling properties, provided the sludge is not exposed to heavy mechanical agitation. In UASB reactors, the anaerobic consortium appears in the form of granules, which are suspended by the produced biogas and movement of recirculating effluent. It was reported that the application of UASB for the combination of dairy and domestic wastewater treatment resulted in a removal efficiency of 69% COD and 79% BOD5 . UASB is efficient and commonly used for agro-industry wastewater such as the sugar industry effluent and distillery spent wash.
UASB is effective among the high-rate anaerobic digestion methods, but its limitations are longer HRTs, long periods of startup and the wash-up of the sludge in the bioreactor . Furthermore, compared to anaerobic filter, UASB is operated at lower OLRs, (4–8 kg/m3 day) [44, 58]. The maximum loading potential of such a flocculent sludge bed system is in the range of 1–4 kg COD/m3 day . The other limitations of this reactor are flotation biomass disintegration of granular sludge, deterioration of performance at low temperatures, impure biogas and insufficient removal of organic matters in the final effluent, which resulted in the failure to comply with the environmental standards for discharge or reuse . Though the development of such high-rate bioreactor enhances wastewater treatment efficiency, further investigations are required to overcome those limitations . Furthermore, the anaerobic treatment of wastewater is an important field of research where improvements and new developments are needed to overcome the limitations of the system . The media used in these reactors are: small particle size sand, activated carbon, etc. for bacterial attachment and growth is kept in the fluidized state by drag forces exerted by the up-flowing wastewater . The carrier of this reactor consists of a granular medium, which is kept fluidized as a result of the frictional resistance of the waste flow. In the fluidized state, each medium used in the treatment provides a large surface area for biofilm formation and growth, which favor the removal efficiency of the reactor . This reactor can be operated either in the up-flow or down-flow modes in which the effluent recycles in the reactor by applying high fluid velocity . The distillery wastewater treated using an anaerobic fluidized bed showed that the maximum COD and BOD5 removal of 77% and 82%, at an optimum of HRT of 8 h, flow rate of the feed 14 L/min and OLR of 39.5 kg COD/m3h, respectively . Even though the anaerobic fluidized bed technology is effective, it is difficult to manage because of problems of relatively high energy requirements and the biofilm stability due to shear stresses or to bed segregation from the inert support material . Furthermore, the improvements are expected since the fluidized bed reactor has drawbacks, such as the need for larger reactor vessels, greater pumping requirements, pressure drop, particle entrainment, etc. The anaerobic sequencing batch reactor is another high-rate bioreactor due to its ease of automation and aeration devices which helped the treatment technology to be used with the possibility of treating a wide variety of wastewaters . Even though this treatment technology is promising for the wastewater treatment sector, most of its performance is comparable with the performance of the conventional activated sludge treatment system. Furthermore, it was observed many times that the efficiency of this treatment system is low and comparable to the conventional biological treatment systems. Therefore, the application of such treatment option is not feasible for high strength of the sugar industry and ethanol distillery wastewater. Treatment of distillery wastewater using batch reactors has not been widely attempted but the maximum BOD5 reduction (86%) occurred at a BOD5 loading rate of 2.74 kg/m3 and digestion temperature of 50 °C was reported . Another high-rate bioreactor is the anaerobic filter which can be used effectively for high-strength organic industrial wastewater treatment in sugar industries and ethanol distilleries. The fixed-film digester is reactor filled with an inert medium or packing that provides a very large surface area for microbial growth through which the influent passes . These anaerobic microorganisms attach themselves to supporting materials and can create a thin layer of anaerobic bacteria called biofilm which gives the digester its name, fixed film. Anaerobic filter is a fixed-film biological wastewater treatment process where the fixed matrix (support medium) provides an attachment surface that supports the anaerobic microorganisms in the form of a biofilm. Compared to many other high-rate reactors, the fixed-film reactor, which includes anaerobic filter, offers the advantages of simplicity of construction, elimination of mechanical repair, better stability even at higher loading rates and capability to withstand toxic shock loads . Another advantage of this reactor is its quick recovery after the starvation process. The anaerobic filter is the first reactor that eliminated the need of recycles and solids separation with the advantages of resistance to shock loads and inhibitions . Proper packing materials help to reduce HRTs, which directly minimize the required volume of the reactor, which can reduce costs of the system. The solid support materials filling inside of an anaerobic fixed-film reactor are the most important component which influences bacterial attachment in bioreactor due to the roughness, porosity, surface area and chemical composition of the supporting materials . In line with this, various types of support materials such as sand, plastics, gravels, reticulated foam polymers, stone, granite, granular activated carbon, quartz, etc. are commonly used in such reactors. The nature of the media used for biofilm attachment has a significant effect on reactor performance, particularly the porous inert media enhance biofilm development considerably as compared to more smooth media. It has also been reported that the organic matter removal efficiency in fixed-bed reactors is directly related to the characteristics of the support materials used for the immobilization of anaerobes . Investigating the use of an appropriate support material is very critical which would allow more bacterial biomass to sustain in the reactor and thus, leading to efficient biodegradation of distillery spent wash is critical . Nowadays, plastic ball is commonly used as support material in the bio-filter reactor because it is relatively cheap, provides a large surface area to volume ratio to support attachment of the abundant microorganisms and high diversity in biofilms. Experiments were carried out using bioball carriers which indicated that biofilms have been developed properly and different communities of microorganisms were formed with total biomass concentration in the moving bed sequencing batch biofilm reactor in the range of 3.18–4.81 g/L with COD removal of 65–97.7% from synthetic wastewater [23, 73]. Furthermore, different efficiencies of two-phase anaerobic reactors were observed and reported. For example, thermophilic two-phase system comprising two bioreactors for the acidogenic and methanogenic phases was used for the treatment of cane molasses spent wash with COD removal efficiency of 65% . 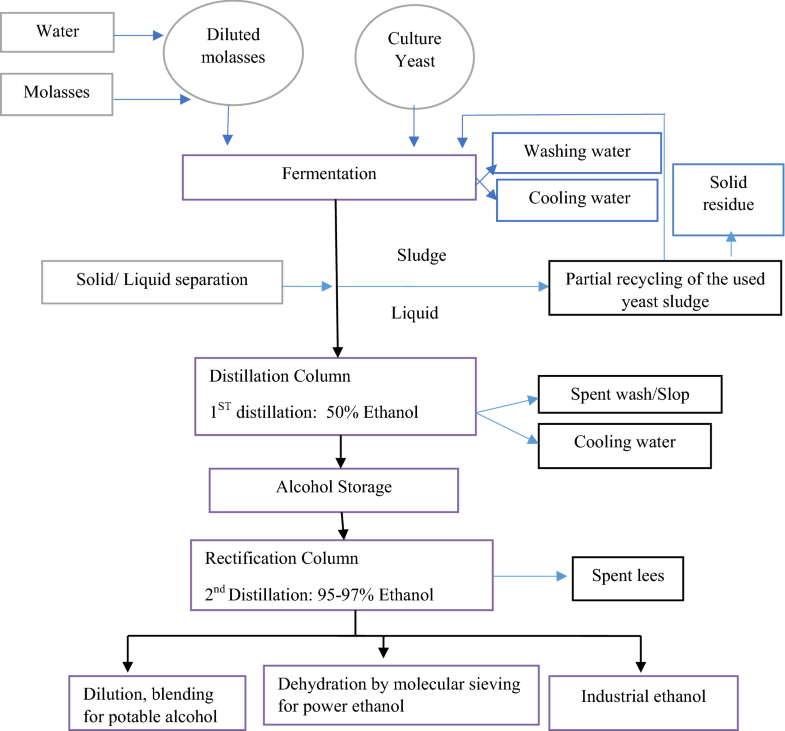 In a similar reactor, anaerobic digestion of distillery waste was studied in a mesophilic two-stage system consisting of an anaerobic filter and an up-flow anaerobic sludge blanket reactor. A treatment efficiency of 93% was achieved with longer HRTs (30–56 days) and higher sludge volume (30% by volume), which was not practical [58, 62]. Many researchers applied and commonly recommended different physicochemical treatment methods for the sugar industry and ethanol distillery spent wash after biological treatment methods [74, 75]. Hence, the intention of this particular literature is to review appropriate treatment technology which can fit as post-treatment of anaerobic digestion in terms of the treatment efficiency, cost and ease of operation as well as the social acceptance. 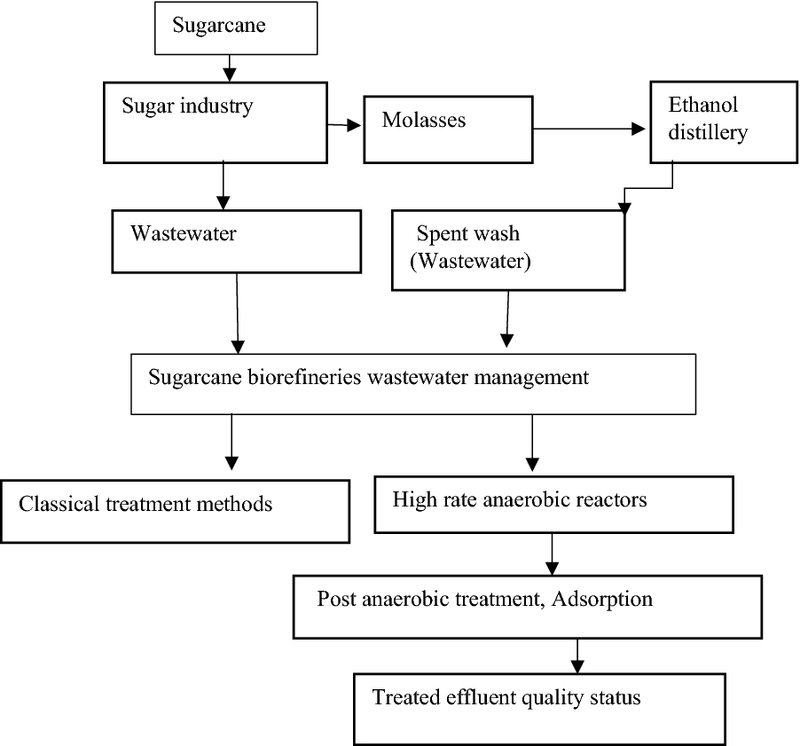 Based on these approaches, various methods have been proposed and applied for the treatment of the sugar industry wastewater and ethanol distillery spent wash. In line with this, many conventional physicochemical treatment methods such as coagulation–flocculation, filtration and different combinations of these methods have also been tested for the treatment of distillery spent wash and sugar industry wastewater . However, these technologies were not effective, particularly in decolorization of the distillery spent wash. Another drawback of these physical–chemical methods is the high treatment costs in addition to the cost of the re-treatment of the byproducts which resulted in increasing the total cost of treatment . Similarly, advanced physicochemical treatment methods such as nanofiltration, reverse osmosis, advanced oxidation processes and membrane technology have been practiced for such wastewater treatment, but their functions are limited due to high energy demand, high capital, operational costs and secondary waste generation . Furthermore, many of these methods are not economically feasible for large scale due to cost limitations . For example, the oxidation by ozone could achieve 80% color removal for biologically treated spent wash which can transform the chromophore groups but does not actually degrade the colored polymeric compounds . Furthermore, wastewater treatment by ozonation is not always feasible because of the high operational cost and demand for electricity. Ion exchange is another physicochemical treatment which can be applied as post-biomethanation of the sugar industry and ethanol distillery wastewater. However, in many cases, ion exchange is used to treat wastewaters containing inorganic wastes which exist in the form of inorganic ions . Hence, this treatment technology might not suitable for high-strength organic industrial wastewater such as sugar industry and ethanol distillery. However, adsorption is an effective physicochemical treatment technology which can be used as post-biomethanation of the sugar industry and ethanol distillery wastewater. Furthermore, adsorption process is found to be effective for the removal of organic compounds in addition to its low cost, universal nature and ease of operation in wastewater treatment technology . Adsorption is a superior technique compared to other methods due to its initial low cost, flexibility, simplicity of design, ease of operation, insensitivity to toxic pollutants and with no formation of harmful substances . Adsorption technique is usually attractive, if the adsorbent material is cheap, more efficient, available in excess and does not require any expensive pretreatment process. Hence, the adsorbents can be prepared from the solid waste materials which can have the advantages of the environmental cleaning and economic benefits. Furthermore, adsorption is more popular because of its possibility of adsorbent reuse or recycling. This technology is commonly employed in wastewater treatment because of its economic viability, technical feasibility and social acceptability . The adsorption process can serve as an attractive alternative wastewater treatment method, especially if the adsorbent is inexpensive and readily available . Adsorption, nowadays, plays a key role in the field of environmental protection since environmental consciousness has been increasing all over the world . Furthermore, the application of such technology for industrial wastewater treatment is rapidly increasing due to the growth of awareness of public and environmental protections . Hence, as a post-biomethanation treatment of the sugar industry and ethanol distillery wastewater, adsorption can be used due to its inexpensiveness, universal nature and ease of operation . The application of sequential treatment methods for blended wastewater was performed using anaerobic digestion followed by the adsorption of BFA as post-treatment, which resulted in the removal of 76% COD and 83% color . The nutrient removals were completed after post-treatment application in many cases but the removal of carbonaceous compounds (COD) was not complete. This is happening due to the fact that there are many recalcitrant compounds in the distillery spent wash. Extraction of sucrose from sugarcane was started many years ago and nowadays, sugar is mainly produced from sugarcane in sugar industries globally. Sugarcane cultivations and processing in sugar industries are high water intensive processes. Hence, proper water conservations and management are highly encouraging for sustainable freshwater uses in this sector. Sugarcane industries generate huge volume of the effluent, particularly from the sugar industry and an ethanol distillery which have different varieties of the pollutants which have a potential to cause a critical environmental pollution problems in developing countries. Nowadays, environmental regulations have been enforced many industries for proper wastes management, and checked the compatibility of the development and environment. Hence, proper management of cane industrial wastewater through the conventional treatment methods is challenging even though elimination of the pollutants is an important task for environmental protection and esthetic values. Recently, among the many treatment methods, high-rate anaerobic digestions have been recognized as effective treatment methods for highly organic saturated sugar industry and ethanol distillery effluents. Even though, UASB bioreactor is practically used in many places for industrial and municipal wastewater treatment; recently, anaerobic filter of fixed-film digester group is emerging with better performance than the other high-rate anaerobic reactors. However, anaerobic digestion alone cannot remove all the pollutants of sugarcane biorefinery’s wastewater. As post-treatment of the anaerobic digestion, another treatment technology is highly recommended for the removal of less biologically degradable organic compounds in terms of the treatment efficiency, cost and ease of operation as well as the social acceptance. Mostly, adsorption treatment technology is considered as a potential candidate for post anaerobic treatment of sugarcane biorefinery’s wastewater. JF contributed to data collection, experimental design, data interpretation and paper write up, whereas both NT and SWHVH contributed to the experimental design, research framework design, statistical analysis and manuscript editing. All authors read and approved the manuscript. We would like to thank the United States Agency for International Development (USAID) for the research fund under the USAID/HED grant in the Africa-US Higher Education Initiative—Grant Numbers, HED 052-9740-ETH-11-01. Not applicable because it is literature review work. United States Agency for International Development (USAID) under the USAID/HED grant in the Africa-US Higher Education Initiative—HED 052-9740-ETH-11-01. Kaushik G. Bioremediation of industrial effluents: distillery effluent. Appl Environ Biotechnol Present Scenar Future Trends. 2015;19–28: https://doi.org/10.1007/978-81-322-2123-4.